Authored by romangg on Mar 18 2018, 10:25 PM. 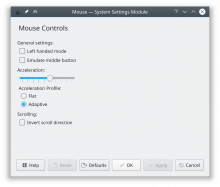 installed X libinput driver and systems with only evdev driver. directory and reapplied on every session start. Note that the libinput backend always takes precedence to the evdev one. Tested X session with and without libinput driver. romangg added a subscriber: plasma-devel. Ah, people are really going to like this. Instead of "acceleration", could we make the label say "speed"? 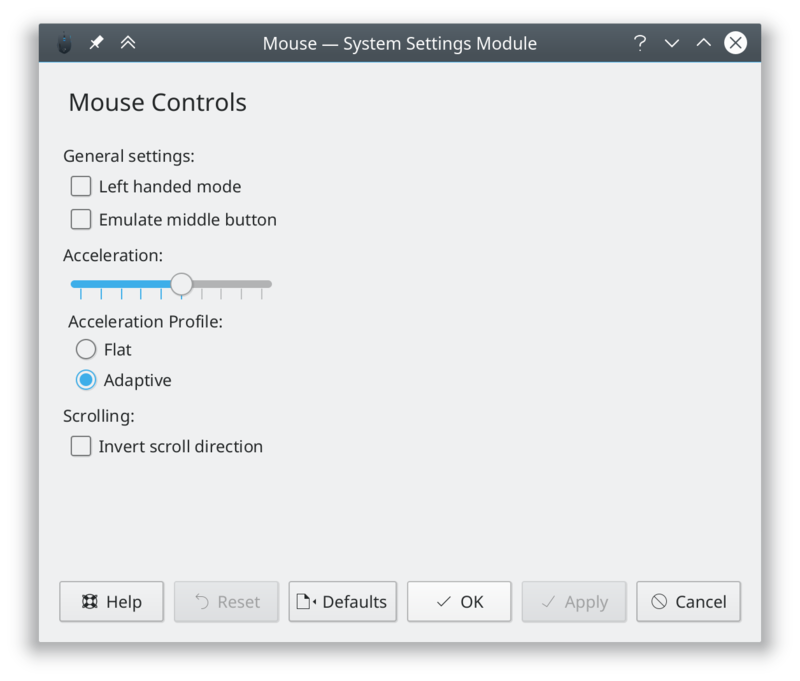 I know "acceleration" is technically what it's controlling, but I think "speed" gets the point across just as well and it's more natural language--more in tune with what people are going to go looking for when they decide they want their mouse to go faster or slower. Right now it looks pretty awkward with everything left-justified. Centering would seem to be more natural. Since the speed/acceleration is the most commonly-changed settings, let's move it up to the top. I think we could put the bottom checkbox on the top, unifying all the "behavior"-style settings in one place. This would seem like a good candidate for using Marco's FormLayout, or at least copying the style. That means aligning all the controls and putting labels to the left of them (except for checkboxes, which always have labels only on the right. I think we could put bottom checkbox on the top, unifying all the "behavior"-style settings in one place. Do you really need to define each individual column like this? Seems like a code small to me. Thanks for your feedback guys. I maybe should have noted that I see the UI more as a placeholder right now and didn't bother about the design. This patch is only about the technical bits. Making the UI beautiful should then go in a separate one ASAP. And I hope someone else might tackle this cause I need to do some KWin work in the imminent future. That's exactly what I expect it (and the Wayland UI and the Touchpap UI) to be built upon in the end. @romangg so is this more of a request just for code review review, then? Yes. You can also just compile and test it to see if there are no regressions. And in case not accept it. will load foo and parse it every time. Do you mean in the cpp file? There are two template specializations defined.